We are thrilled to announce the winners of our 2014 Danihers Catholic Secondary College Grant – St Peters College Cranbourne, Mazenod College and Galen College. We took the opportunity to present $16,000 worth of grants at the recent conference for the Principals’ Association of Victorian Catholic Secondary Schools (PAVCSS), a group we have sponsored for more than eight years. We share many values with the catholic education community and are proud that we have provided sponsorship and support to so many colleges over this time. The winning team at St Peters College will use their grant for a Human Powered Vehicle Program which offers health, wellbeing, community, leadership and environmental benefits to the students. Mazenod College will use the funds for its Special Olympics event for children with disabilities in the City of Monash, and Galen College will sponsor two visiting guests from an impoverished school in Abafala, Timor L’Este. We had an extra surprise on the night with two special commendation grants for Simonds College and St Aloysius College to assist with sports equipment and an outdoor education program. Special recognition grants will also go to St Monica’s College for their social justice program to increase awareness of homelessness, poverty and slavery. Caroline Chisholm Catholic College will receive a grant for its parents retreat and emergency refugee accommodation project. Our sponsorship program for 2014 and 2015 will include more exciting grants, initiatives and benefits for our valued clients. Stay tuned for more details. Special thanks to our independent judges for their ongoing support. 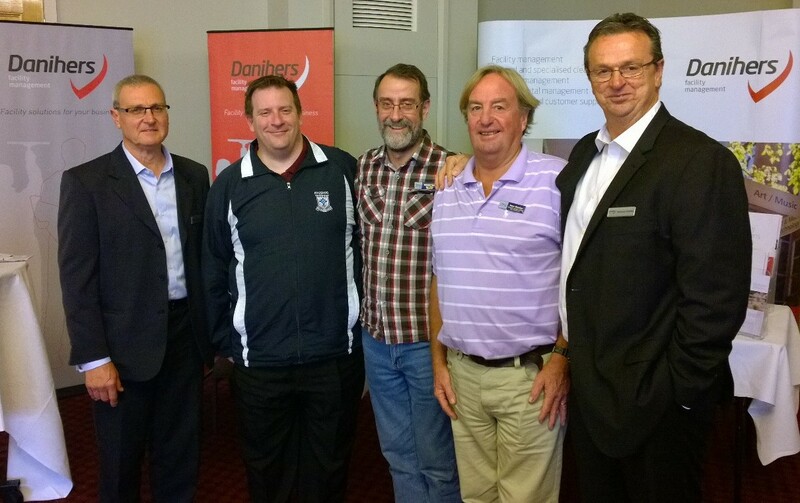 Jeff Murray (left) and Anthony Daniher (right) congratulate the grant winners – Father Michael Twigg from Mazenod College, Bernard Neal from Galen College and Peter Riordan from Simonds College.